Like SPAM? You're going to love this recipe. Bourdain sourced this one from the other side of the globe. 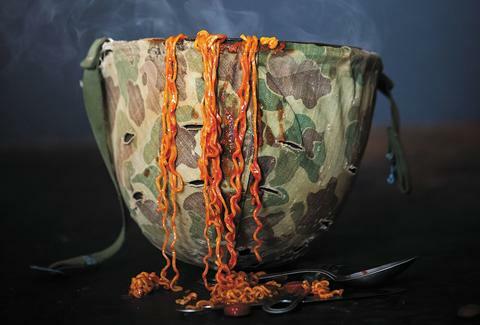 "This is known as Korean army stew, created, according to legend, from scrounged army PX canned goods during wartime," he wrote. "It's the ultimate dorm food. Just looking at the ingredients might make it sound like a horror, but it very quickly comes together and becomes delicious. It captures the essence of great cooking over the last few centuries: improvisational, born of war and hardship, nostalgic, sentimental, and transformative." To make the anchovy broth, combine the mushroom, anchovies, kelp, 4 cups water, and the salt in a medium heavy-bottom pot, and bring to a boil. Reduce to a simmer and cook for 30 minutes. Remove from the heat, strain and discard the solids, and set the broth aside. Place the SPAM, kimchee, rice cakes, onion, scallions, garlic, hot dogs, and pork in small separate piles in a large shallow pot. Add the soy sauce, gochujang, gochugaru, and cheongju to the pot, then slowly pour in the reserved anchovy kelp broth. Add the baked beans and 1½ cups water. Bring the contents to a steady simmer over high heat, stirring occasionally with a wooden spoon. Cook for about 10 minutes, then add the ramen noodles. Ladle the broth over the noodles to help them break apart. Continue to cook for 2 or 3 minutes, until the noodles are cooked through but still chewy.